In the lead up to Christmas, nothing seems more exciting than visiting shops and getting the shopping underway. Picking up gifts for loved ones and finding a few pennies to treat yourself along the way too. 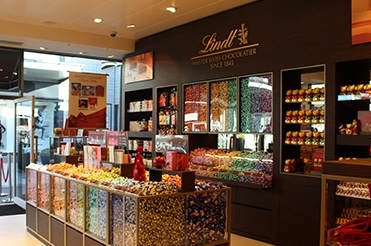 An exciting new arrival to Dalton Park this month, is Lindt. A whole shop dedicated to the master swiss chocolatier which makes quite a statement as you enter the mall. Inside you’ll be tantalised with a selection of colours – trust me, when you see the pick and mix, you’ll know what I mean! I felt like a child again seeing the rainbow of colours and my eyes keenly picking out different flavours, exclusive to the pick and mix selection. Cappuccino, for example, immediately caught my eye and a handful made their way into my carefully curated bag of treats. Being my staple coffee order, I couldn’t wait to try the Lindor chocolate variation and I must say, it’s really quite delicious. With the famous melt in your mouth texture and smooth coffee flavour, I will have to ration the ones I have left… until I make a trip back to restock! Other ones you may spot include Almond, Caramel, Citrus and Stracciatella. And yes, you guessed it, they all found their way into my selection. As well as a few favourites like Mint and Orange. It’s not just Lindor though, you’ll find the Lindt chocolate balls, heart shapes, mini pieces of their chocolate bars and varieties of coffee chocolates. If you don’t want to go for the pick and mix, priced at £2.99 per 100g, you can find the pre-packed Lindor boxes in store. 200g boxes are under £5 and you can make up a bag of 4 for around £14. Know someone who loves the original milk Lindors? Treat them to a bigger box for £10, or even try one of the limited edition boxes that have a few favourite flavours in. Something really exciting in store is the chance to customise your own advent calendar for £12. So if your favourite Lindt Lindor chocolate is Coconut, you can have your full advent calendar filled with them. Alternatively, pick a selection to keep some of the festive magic. I think this would be a really nice gift to personalise for someone. But you better start dropping some hints and find out their favourite flavour soon! Well, these chocolates aren’t going to eat themselves… I’ll see you in store! Content and images by Tasha Steel, from www.hello-freckles.com an award winning lifestyle blog covering everything from the latest lipsticks to hidden food gems and style advice. If you are happy for us to use your personal information to send you an e-newsletter and other marketing emails for Dalton Park, please provide your personal information and tick the box below.